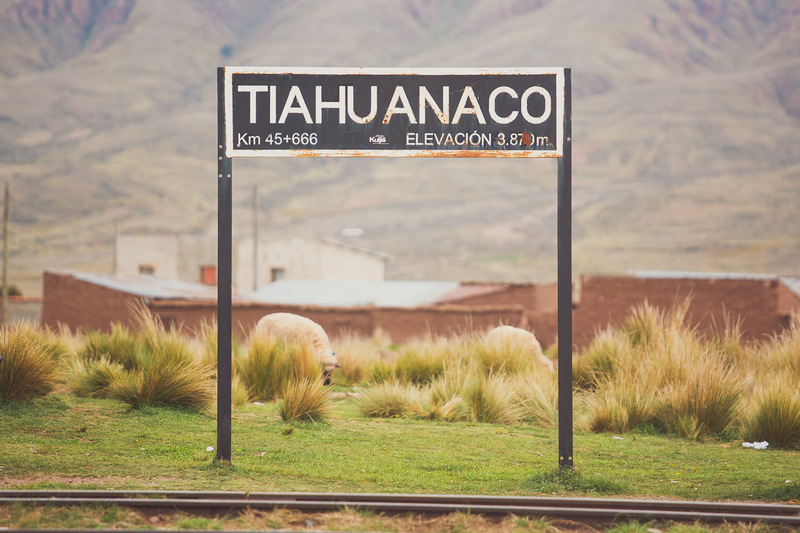 As I described in our last post, our original plan had been to enter Bolivia for just a few days and then turn north, towards Cusco, where we were going to have some extended time off the bikes as the wet season peaks over the coming months. 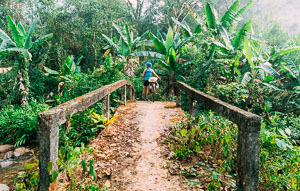 But I think neither of us had ever been 100% comfortable with that plan, and as we hopped on our bikes one morning in Achacachi, outside one of the grottiest hospedaje’s we’ve stayed in, I turned to Hana and suggested we take some extra time to reconsider. One of the things that has helped our two-and-a-half year journey to flow and feel consistently engaging has been our ability to question our motives and expectations for each leg of the ride and to make sure we are making the most of each part of it. 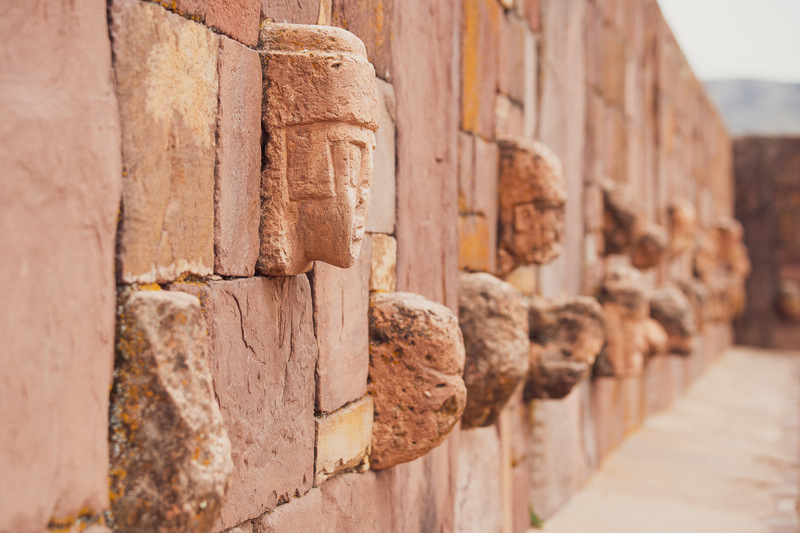 Our doubts about heading straight to Cusco stirred from the fact that the weather is already quite wet there, and the realisation that we weren’t quite ready to hang up our helmets for a few months. 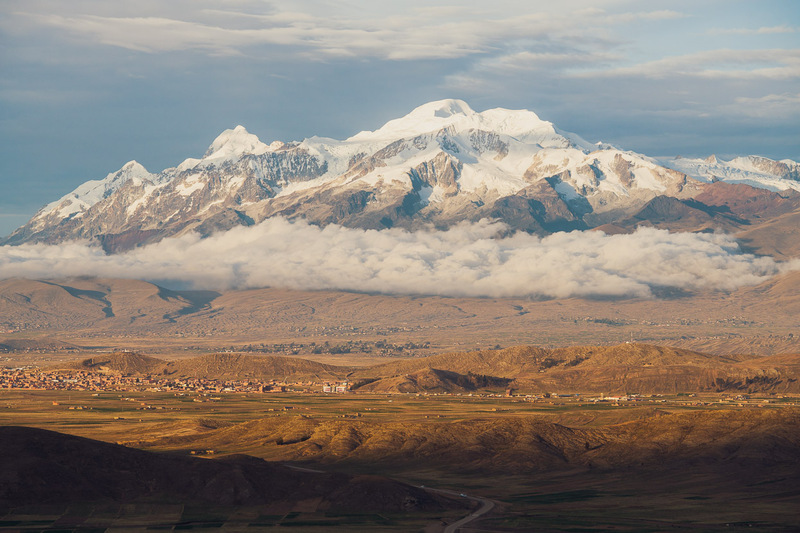 With the weather so good in south western Peru, terrain to explore (and the motivation to do it), why stop? 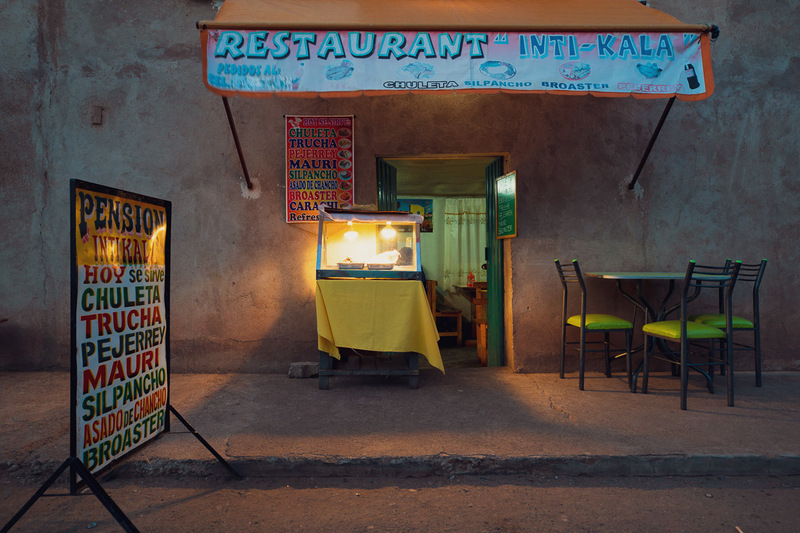 And furthermore, with sunshine and nice temps in Arequipa – why not hang out there for a few weeks first? Sounds like a simple enough decision, but reaching that point wasn’t quite so simple. We turned the bikes around and banged on the hospedaje door, asking if we could leave the bikes there while we went to an internet cafe to so some more research. Over an hour, we looked at rainfall graphs, forecasts and started working through all possible options for the following months: including bike packing routes in Bolivia and northern Chile. 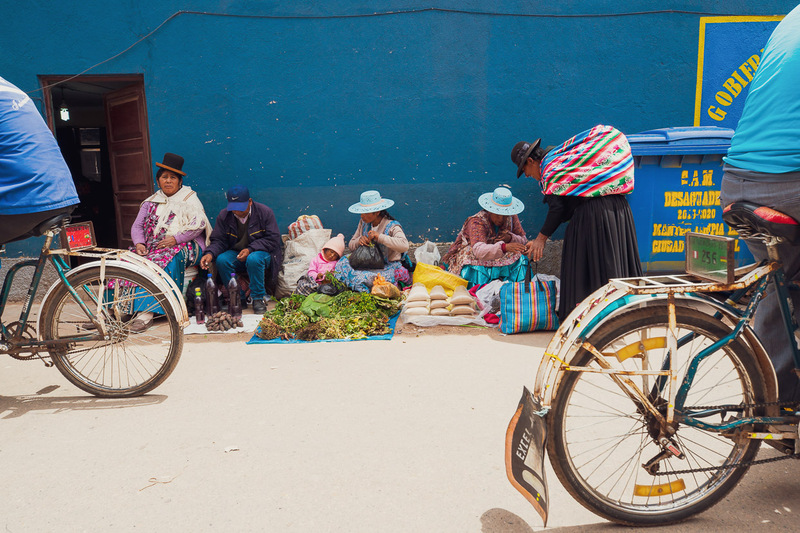 We gleaned enough info to definitely rule out Cusco, for now, and decided to explore options for a ride back to Arequipa – a good 10 days away. In the end we found another (slighter better) hospedaje, checked in, bought a local SIM card and 2GB of data (there was no wifi anywhere) and sat down with Ride With GPS and started planning a route back to sunny Arequipa. The cool thing was, after much studying of satellite maps, back roads and the terrain of the region we came up with a route we were really excited about: through an expanse of remote country, with archaeological sites, volcanoes, a canyon and few people. 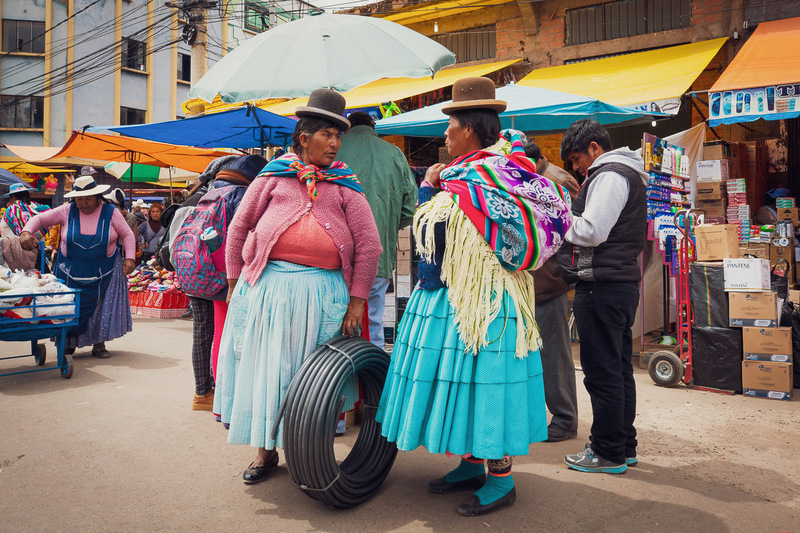 Here’s some images from the first four days from Copacabana through to the Peru/Bolivia Border at Desaguadero. 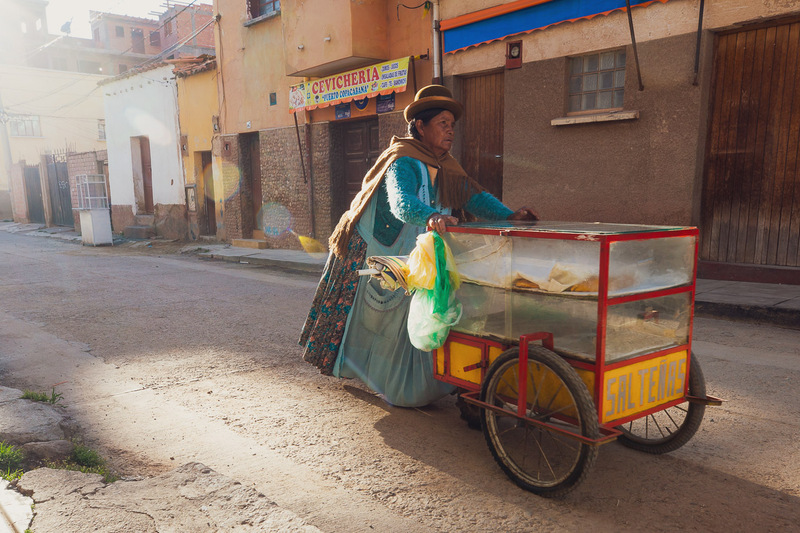 The bulk of the ride to Arequipa will be in the next post. 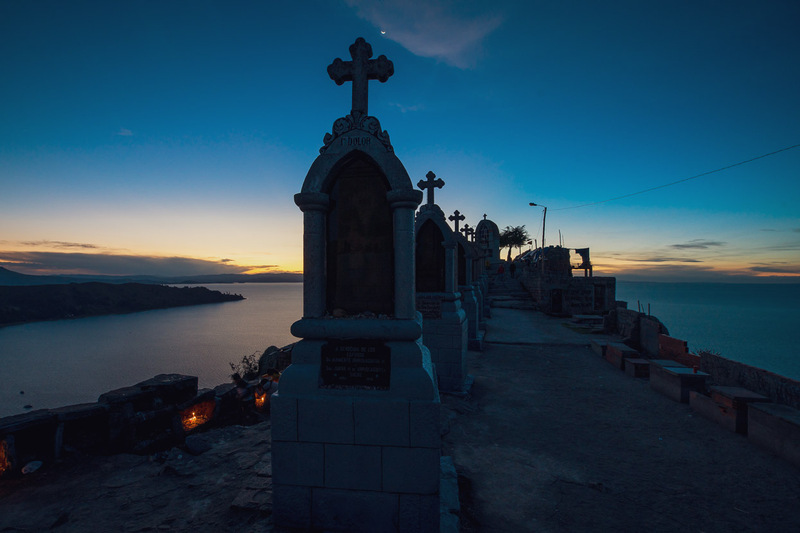 Stations of the Cross atop Cerro Calvario in Copacabana. We had three nice days off in this pleasant tourist town after our seven day ride across from Arequipa. 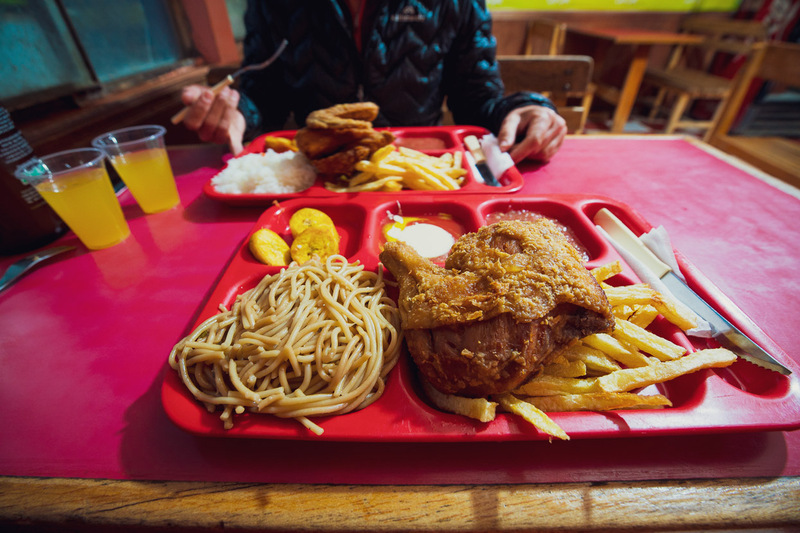 The food here, oriented towards a tourist’s palate, is particularly good and very cheap – good news for cyclists bored of the typically very basic fare served in village and small town comedors. 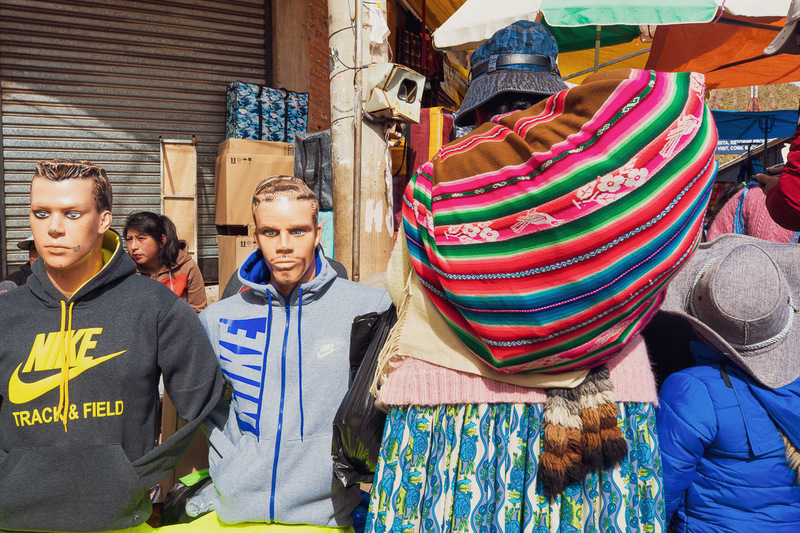 Another thing I liked about Copacabana is that you can walk a block or two away from the tourist-alley that leads to the waterfront and find people in traditional dress and more typical Bolivan culture. 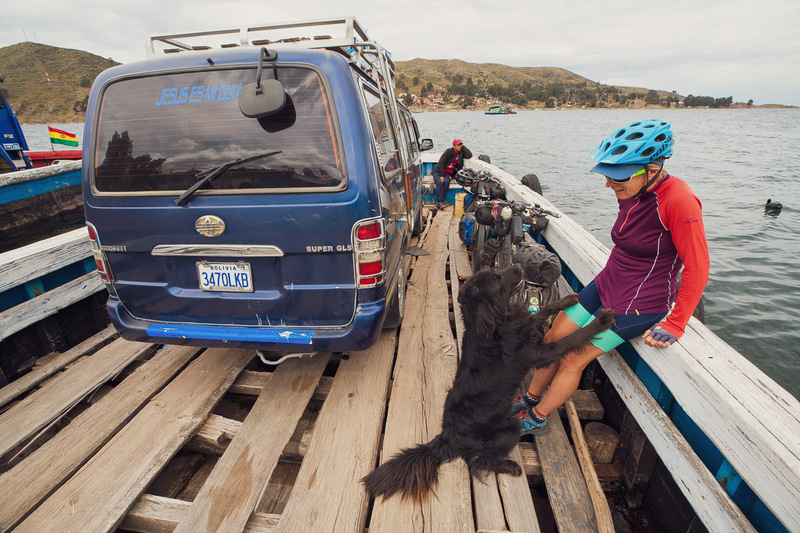 To get from Copacabana to Achacachi we mapped out a route that followed as much dirt as possible – mostly keeping off the single paved highway that connects the complicated series of bays and peninsulas along the edge of the lake. At one point, in a quiet grassy valley we reached a chain across the single lane dirt road, and without thinking anything of it, rode around it. 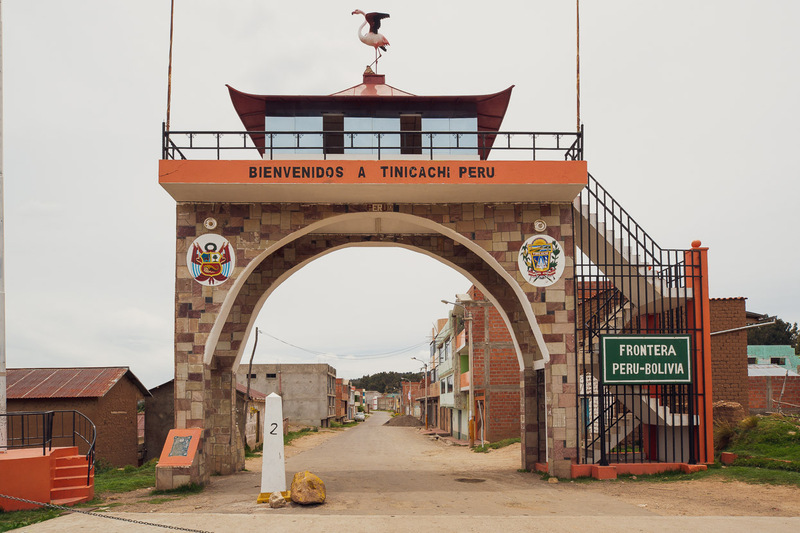 About half an hour later we reached a much more official looking ‘entry’ and realised we’d inadvertantly ridden back into Peru for a few kilometres. This border station was unmanned, so we didn’t have any problems, but it was quite funny all the same. A ferry crosses the narrow strait that separates the twin villages of San Pedro de Tiquina and San Pablo de Tiquina. They’re a dodgy arrangement, with several small barges operating at once and some carrying full size passenger busses. The strait is quite choppy in the middle and the list on some of these vessels was huge. Thank God the passengers have to get off the busses! The dog that’s attempting to make friends with Hana followed us on the ferry after I gave it a stale bread roll and then ran alongside us on the highway for the following 10 kilometres. We finally left it behind – somewhat guiltily – on a long downhill. A dog followed us for 15 kilometres of steady climbing in Mexico once – that’s the record so far. Crossing the final set of hills to the plain surrounding Achacachi we got an awesome view of the Cordillera Real and the ice-field clad massif of Ancohuma (6427m), the third highest peak in Bolivia. It was quite exciting to catch a view of this range we’d heard so much about. The Tres Cordilleras bikepacking route crosses the foothills in front of these ranges. 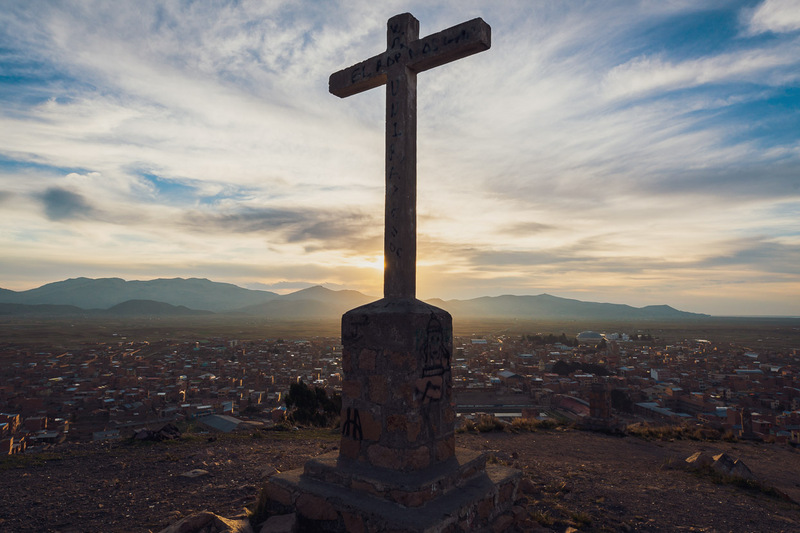 As mentioned in the introduction, Achacachi, spread out on the plain below this cross, was where we hatched a new plan. 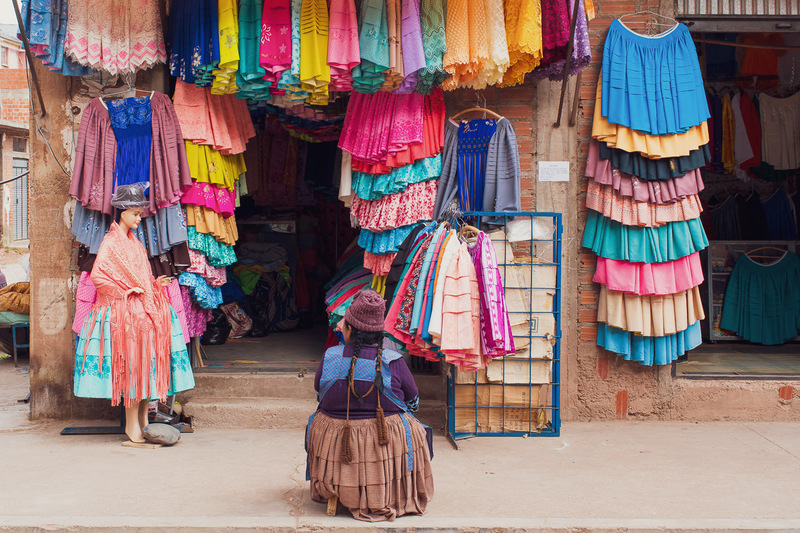 We’re used to spending time in all sorts of rough, dirty and loose sorts of towns, but after Copacabana, this place could not have contrasted more. 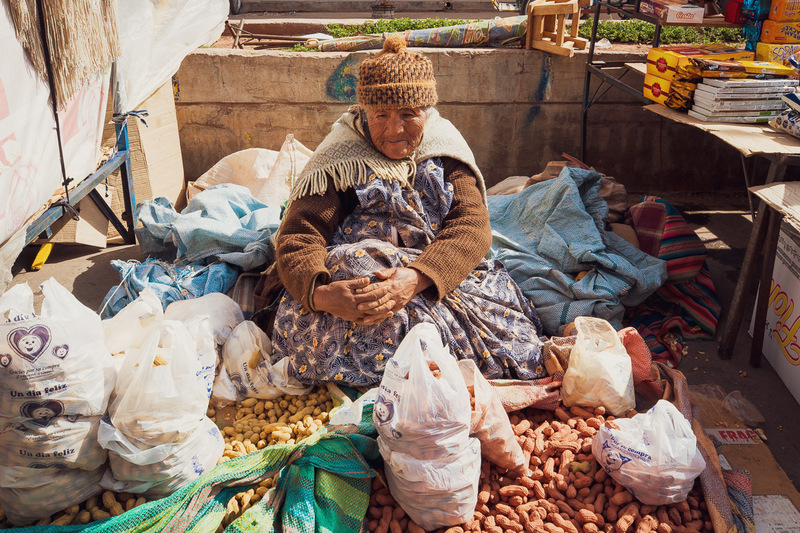 The streets stank of overflowed sewage, the hospedajes were ‘feo’ (ugly), to use the phrase of the young girl who sold us a SIM card and there was hardly any decent food to buy. Definitely a step down from Copacabana. We ate this two nights in a row. Good thing we burn a lot of calories! 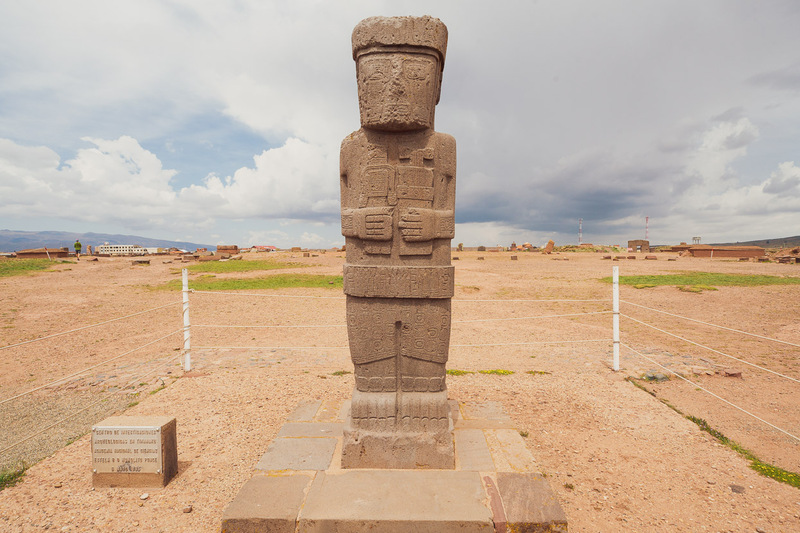 With a route across to Arequipa loaded into the GPS we set off towards the the first highlight, Tiwanaku. The route followed a mixture of highway (generally quiet) and peaceful dirt roads. 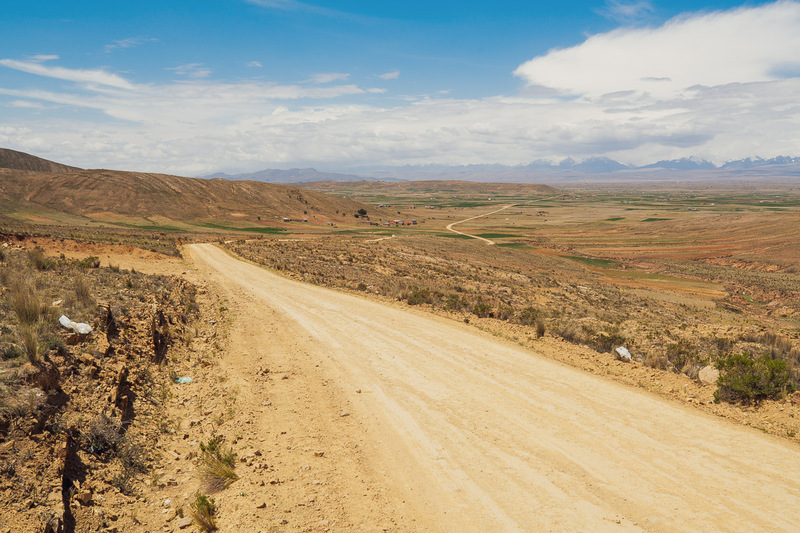 For a change the landscape was flat, with gently rolling hills as we passed around the southern end of Lake Titicaca. It’s easy to visualise how this lake – probably at the end of the last ice age – was once much larger, and the small hills we cross islands or peninsulas. 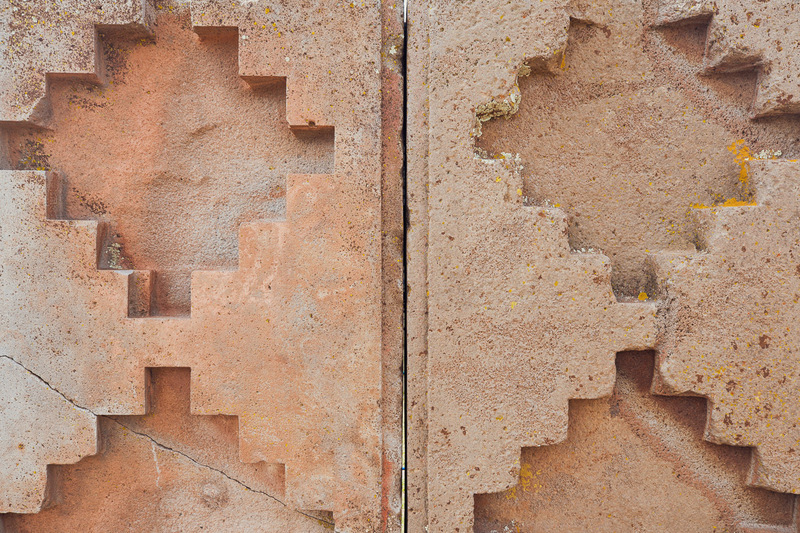 The modern village of Tiwanaku occupies the edge of an archeological site of the same name. We found a cheap room above a comedor/tienda and the next morning went to check out the site. 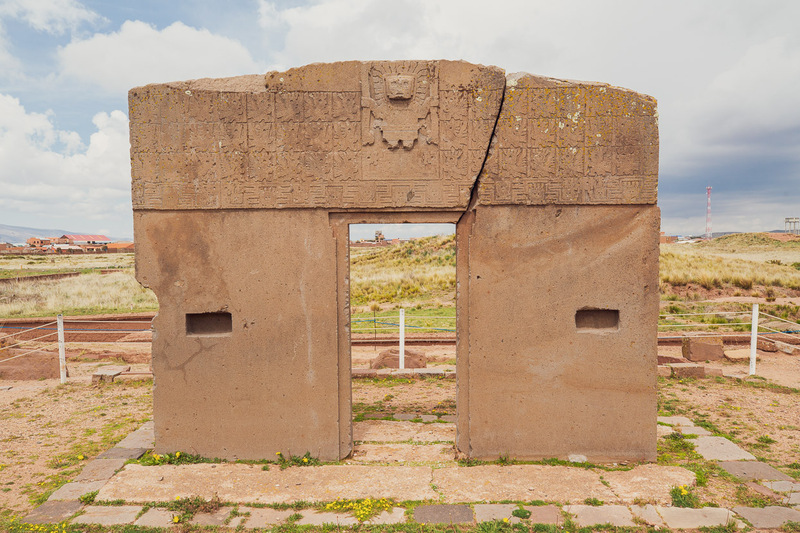 The Tiwanaku (in Spanish Tiahuanaco) were one of the great civilisations of the Andes, spanning a period of well over 1000 years until the arrival of the Inca Empire. Their influence and territory extended all the way to the coast of Peru to the west and south into Chile. 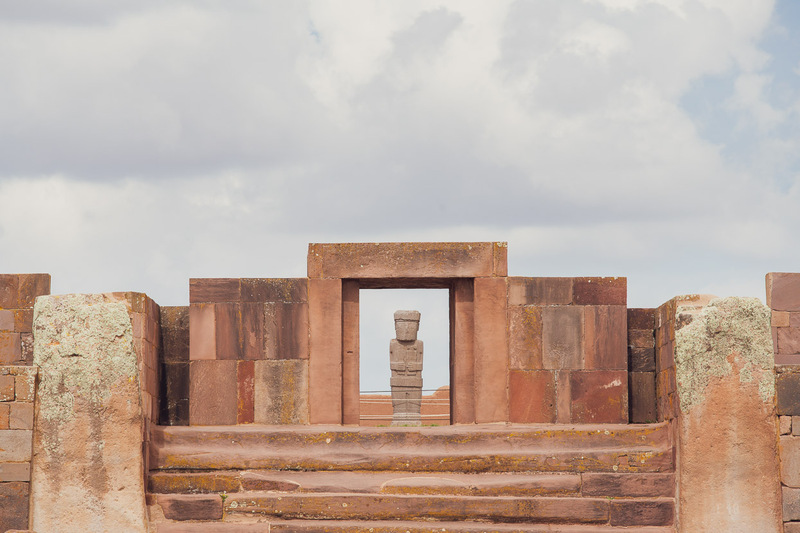 The state’s political core – an important pilgrimage site in its time – was the southern edge of Lake Titicaca, where the main archeological site is located. But they had widely scattered colonies. 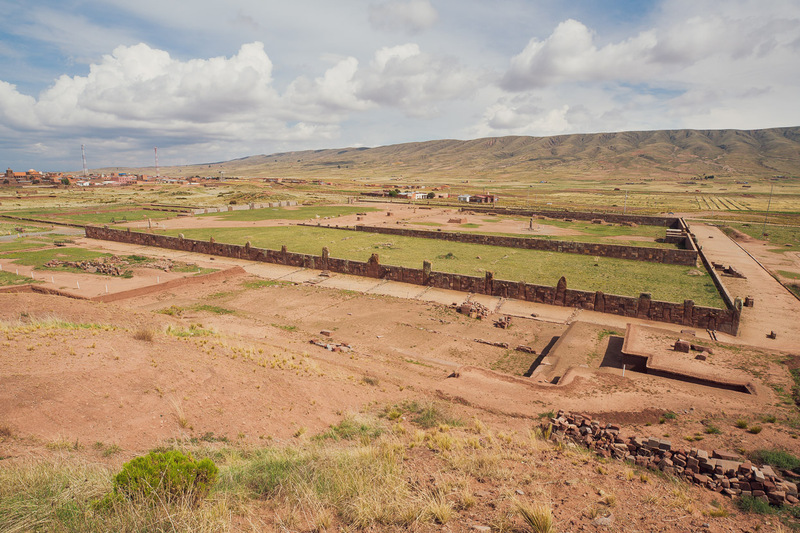 The Tiwanaku site is thought to have been a city of 10,000 – 20,000 people at its peak; one of the continent’s largest pre-Columbian cities. 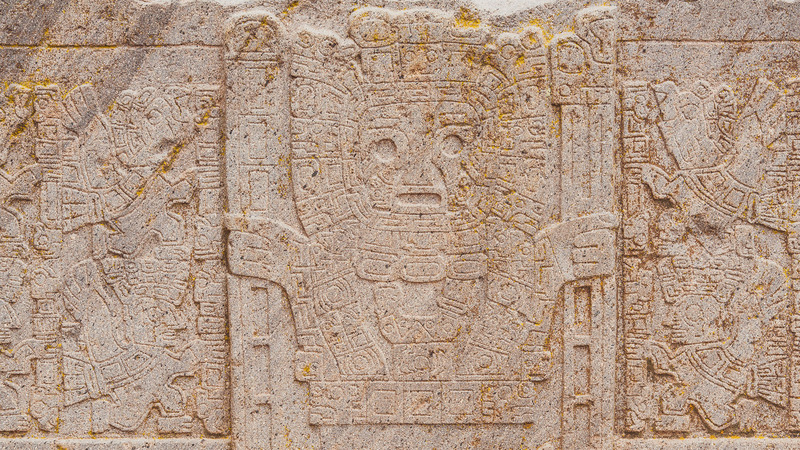 The site doesn’t have the visual impact of the great Maya pyramids or Machu Picchu, but it is unique in some of its features and is particularly notable for its huge stone archways and statues (one seven metres tall); carved from solid basalt that was quarried from a location 40 kilometres away. These are incredible feats of engineering and labour (no doubt at huge expense of the peasant classes of the time). The largest block on the site weights nearly 27 tons. The Semi- Subterranean Temple was one of my favourite features. 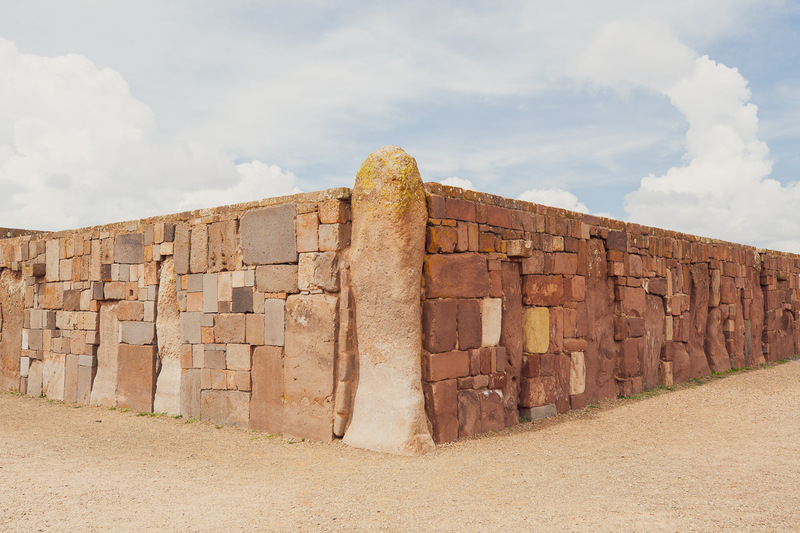 It’s a quarried and carved stone-lined pit, roughly 20 metres by 20 metres and four metres deep, with internal walls studded with tenon heads (heads designed to be inserted into walls). They vary hugely in style and it’s thought the temple was used for different purposes over time. 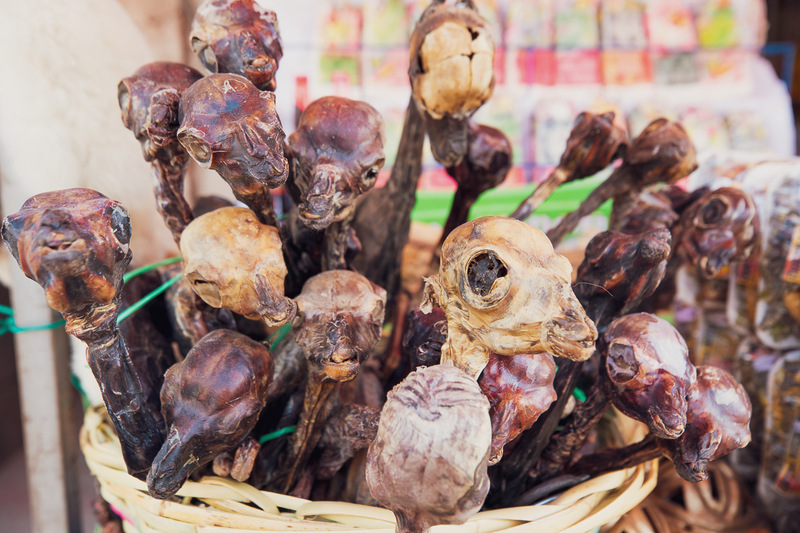 The heads are thought to represent the practice of displaying the severed heads of enemies. The Ponce Monolith. This one’s actually pretty small compared with the 7 metre tall Bennett Monolith which is displayed in the adjacent museum. Photography of the Bennett is forbidden, but for me it was the most impressive feature of the site and it must have looked incredible in its original location in the temple complex. 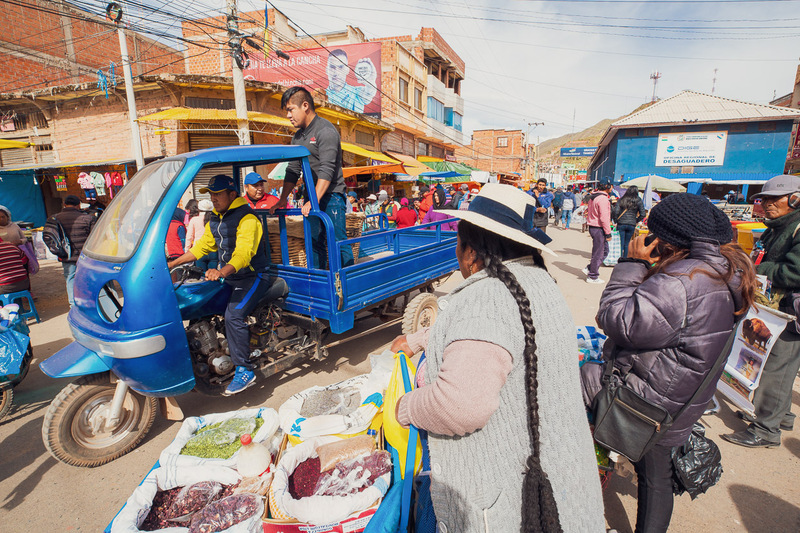 An easy ride in the afternoon took us on to Desaguadero, the busiest of the three border crossings between Peru and Bolivia. Lonely Planet take a disparaging view of this border town, warning travellers off staying the night there. 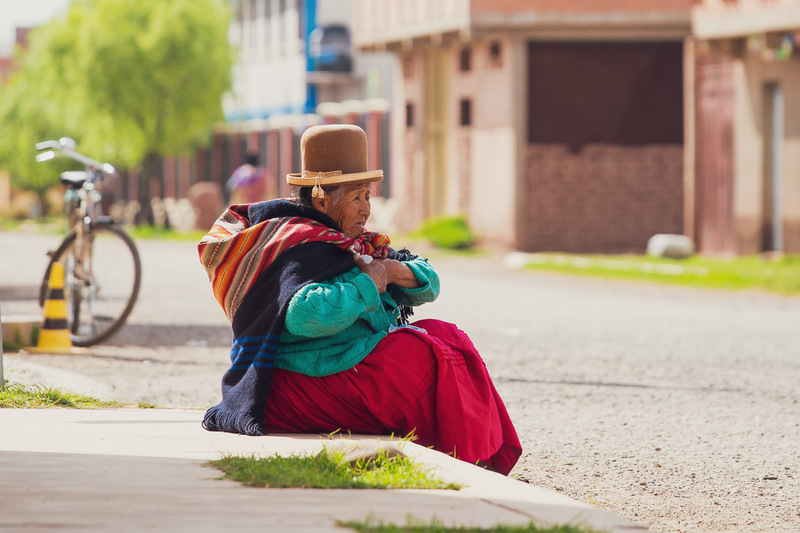 But we didn’t find it too different to many of the other rough and ready towns we’ve visited in Latin America and certainly didn’t think it felt especially unsafe. 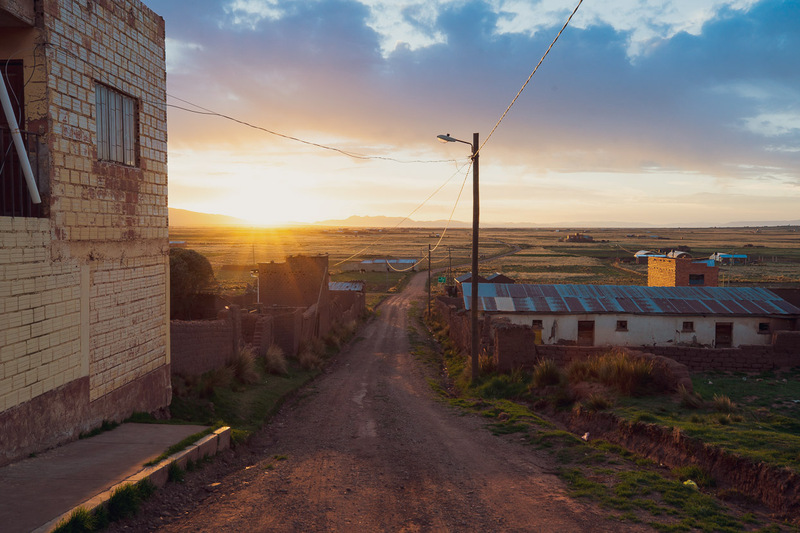 We needed an internet connection while we waited to hear from friend so we ended up spending two nights in a hotel on the Bolivian side before we crossed into Peru (the Peruvian side is bigger and has more services). 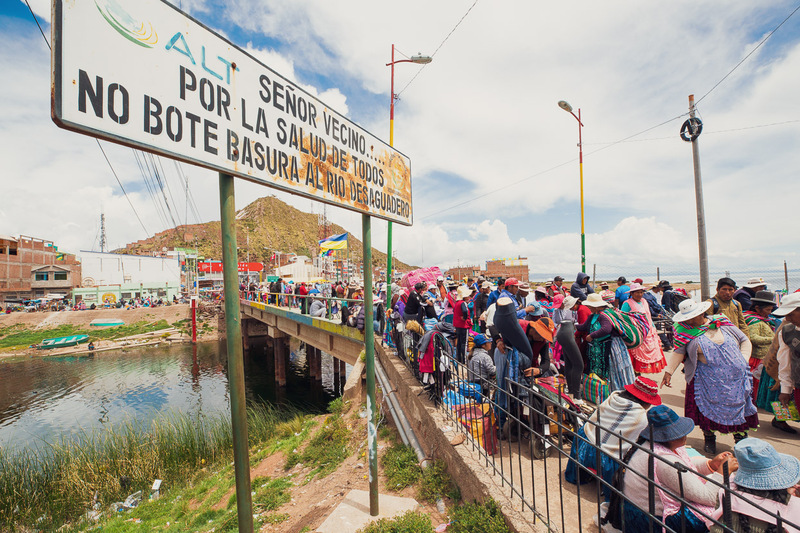 The flow of goods across this border (from Peru) is incredible, and our day off coincided with market day, which meant the bridge over the Lake Titicaca outlet was crammed with people and all manner of goods all day. 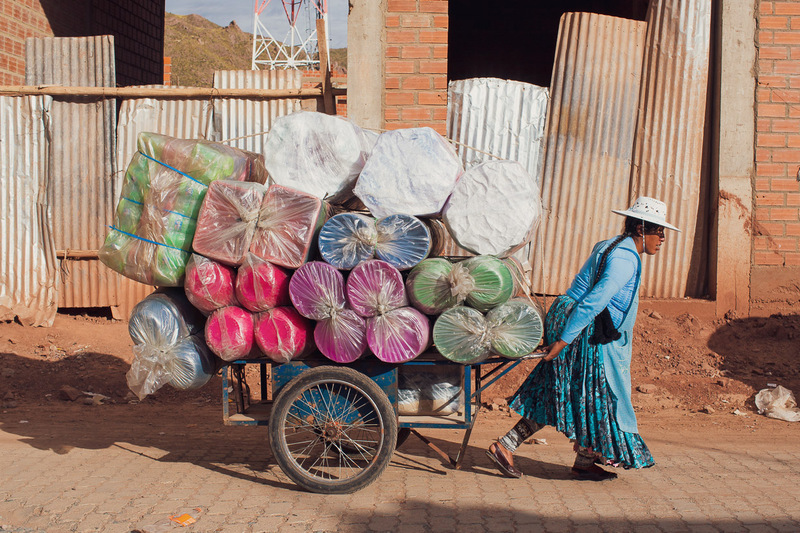 Items (mostly household goods and fruit and veg) pour into the country here and are piled onto overloaded trucks and busses, presumably headed to the Bolivian capital La Paz. We spent a few hours watching the activity as cycle-trollies wove through the crowds of people, ferrying goods to trucks. 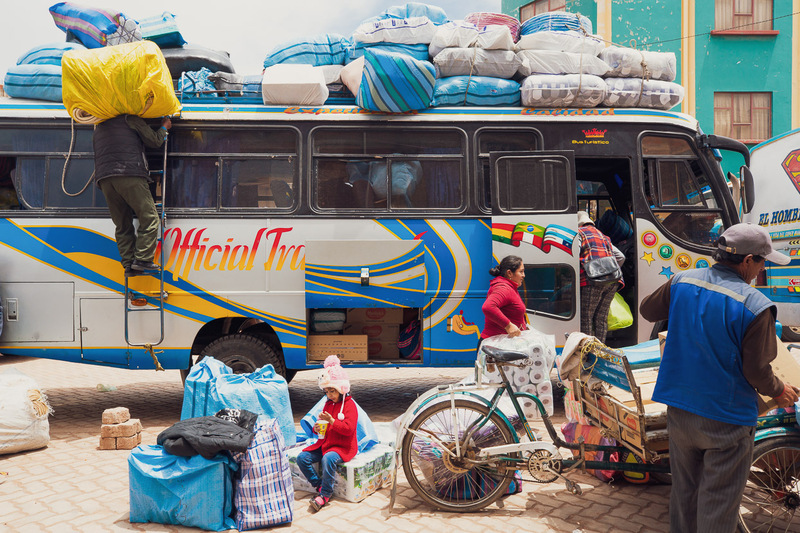 Busses were piled high (as tall as the bus itself) with bed mattresses before driving off, lopsidedly, down the road. 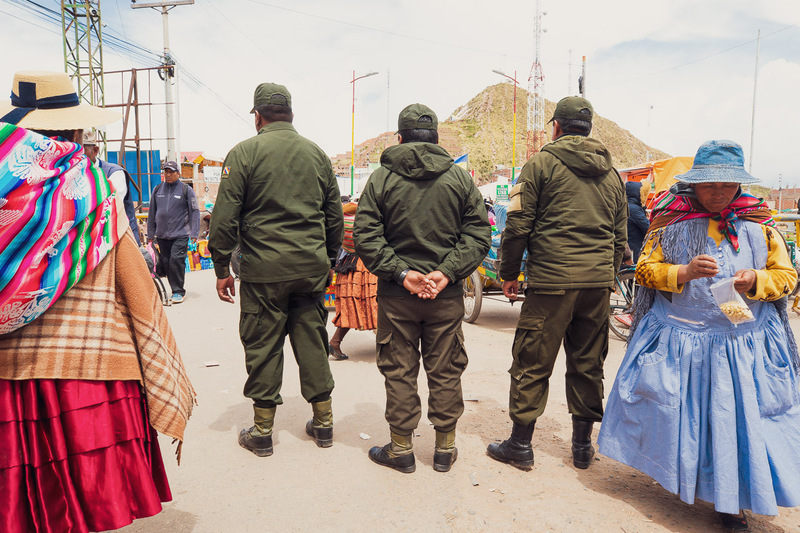 The border appeared to be completely open, to ‘locals’, that day, but three Bolivian policemen stood on guard for foreigners and I saw them haul at least one young woman aside, who might have been hoping to sneak through amongst the crowd. 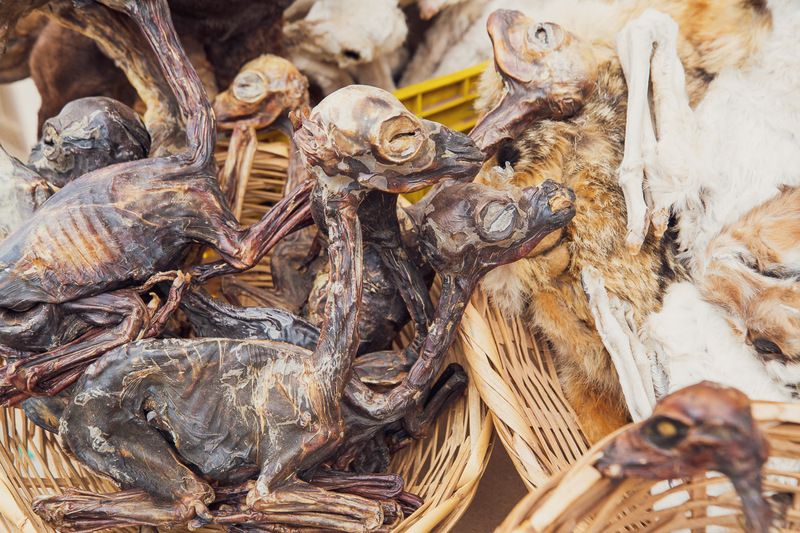 One of the creepier sights were these mummified llama foetuses, piled up outside a couple of shops. 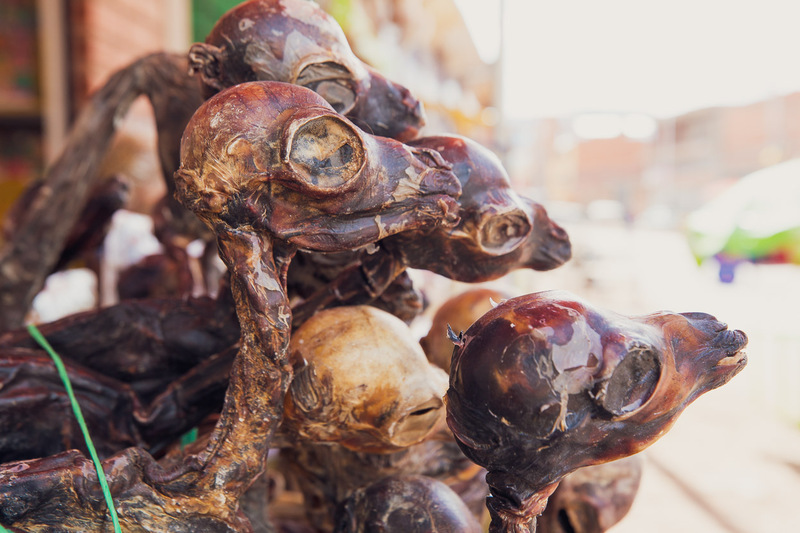 These camelids have an abnormally high rate of miscarriage, and with the llama considered a sacred animal by traditional societies here, the foetuses are not left to waste. They’re sometimes also plucked from a pregnant animal that has been slaughtered for meat. My understanding is that they’re typically used to ritually bless and bring good luck to new buildings, by being placed underneath. 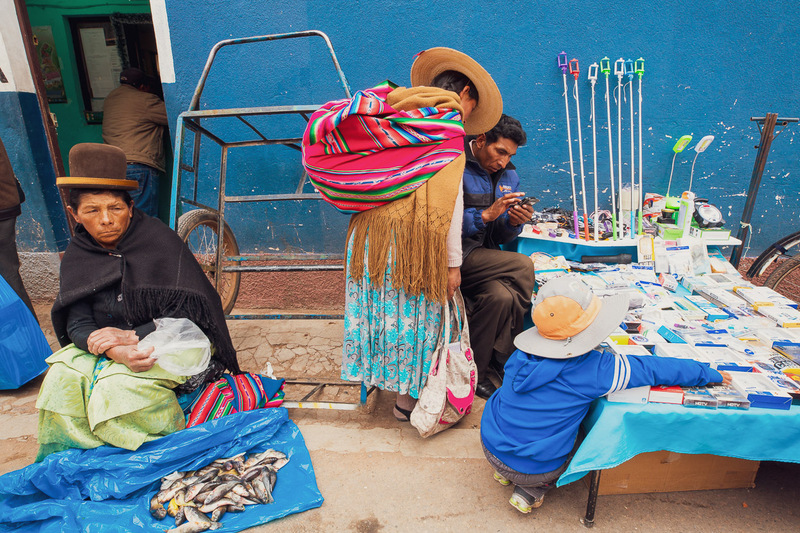 From peanuts, to fish, to selfie sticks – it’s all here on market day. 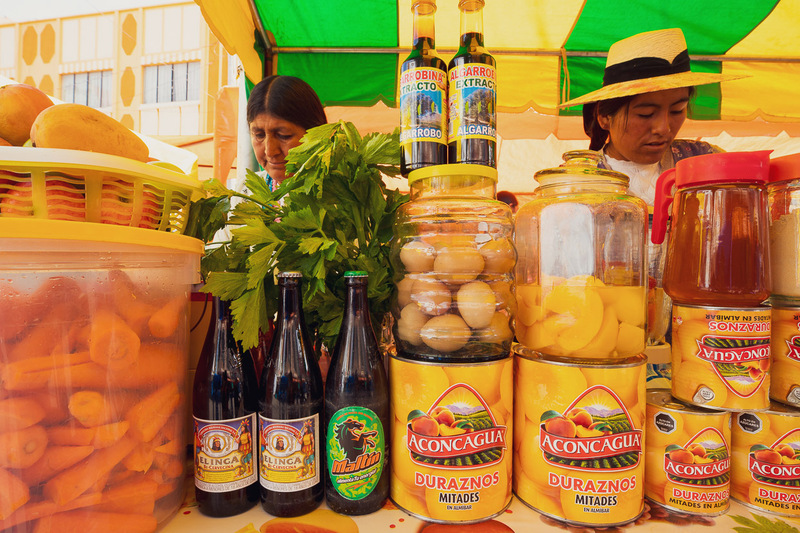 Or a ubiquitous jugo, made with fresh fruit, milk and lots of sugar (with beer added too if you’re into that). 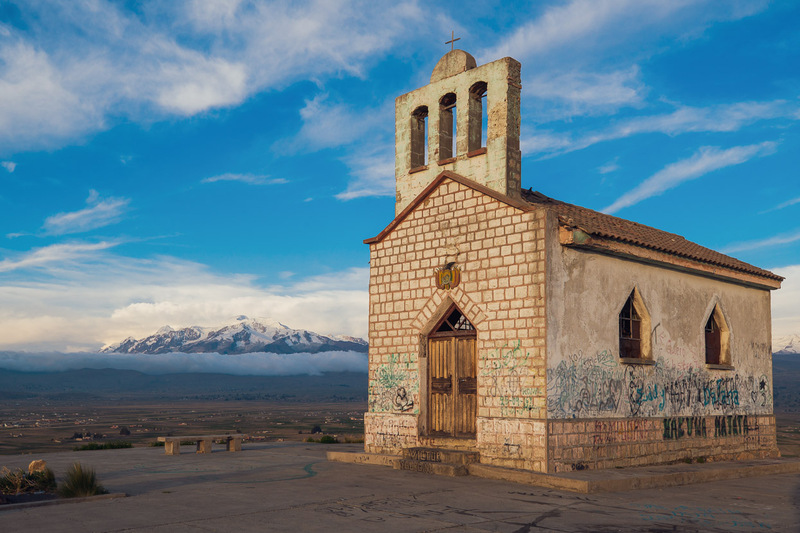 More from our epic ride across to Arequipa coming soon. Creating content for this site – as much as we love it – is time consuming and adds to travel costs. Every little bit helps, and your contributions motivate us to work on more bicycle travel-related content. I concur with your assessment of Achocachi. Its a S***hole. We had planned to stay there the night, but only lasted there as long as it took for us to eat our lunch.